Today marks the 10th anniversary of one of Pixar’s most treasured films, The Incredibles. A sequel is in the works, but it’s not due for another few years. In the meantime, let’s take a look at some myths about the movie that deserve to be busted. Specifically, one of my favorite websites (as you know) is Cracked.com, and they’ve celebrated the anniversary by poking some light-hearted fun at the movie and Pixar. Let’s take a look! The Incredibles shares more than just a premise with the graphic novel Watchmen, which later became a movie itself, albeit one that replaces the source material’s Reagan-era malaise with emo hissy fits. As pointed out by Baltimore Sun writer Michael Sragow, both stories concern a world where superheroes exist but have been forced to retire after the American government outlaws their work for political reasons (apparently Canada and Mexico don’t have any crime worth fighting). Both movies feature a pathetic hero who feels emasculated in retirement — Nite Owl in Watchmen, Mr. Incredible in The Incredibles. They’re getting old, they’re getting fat, and they’re disillusioned by their mundane lives. Both superheroes are drawn out of retirement to investigate the disappearances of other retired superheroes. They eventually discover that the murderers are exceptionally intelligent supervillains with no actual powers. 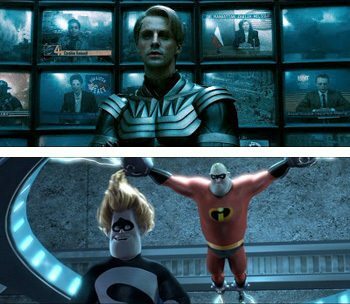 There’s Ozymandias in Watchmen and Syndrome in The Incredibles — both once wanted to be superheroes, and even as villains they believe they’re serving the greater good. Also, they both have dumb hair. There are a lot of issues with that last point, the main one being that Ozymandias wasn’t an outsider to the superheroes like Syndrome was. And his motivations have nothing to do with being accepted as a superhero, as opposed to Syndrome. Their goals, endgame and character arcs are wildly distinct. The hair thing is pretty accurate, though. Going further, the reasons for why superheroes were outlawed are vastly different between to the two stories. In Incredibles, supers were banned because of their collateral damage and perceived negative influence on the world. Humans just wanted them gone. In Watchmen, superheroes weren’t really necessary anymore because Mr. Manhattan was a demigod who could solve everyone’s problems (and wars) at will. So the differences between these stories come down to need vs. want. Lastly, Mr. Incredible is not “drawn out of retirement to investigate the disappearances of other retired superheroes.” That’s just completely false. 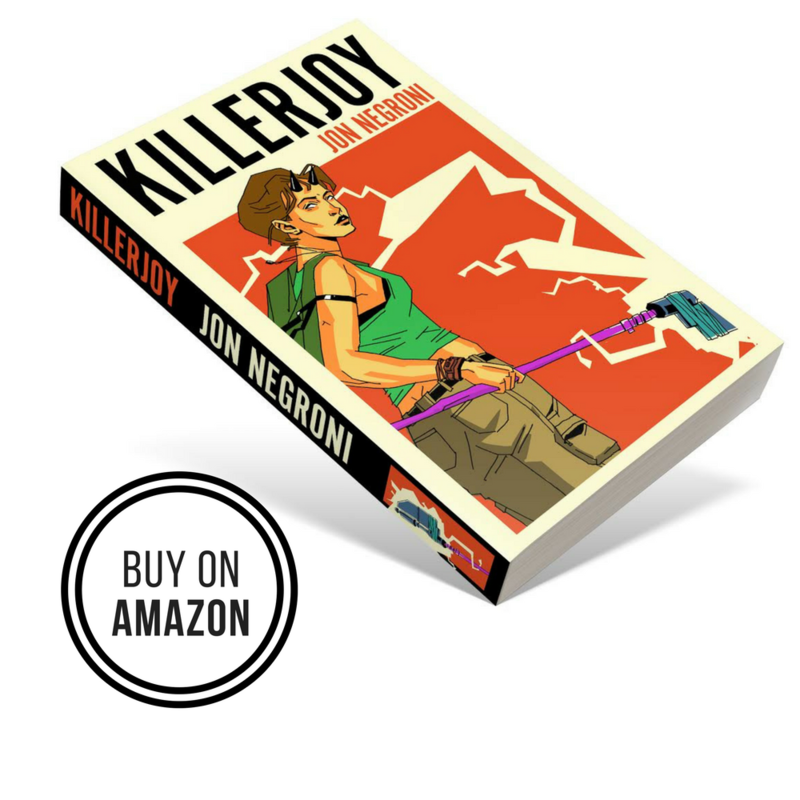 He’s lured out of retirement to relive the glory days and work for what he believes to be a top-secret government agency. He just wants to be a super again. He doesn’t even realize superheroes are being hunted and killed en masse until a while after Syndrome betrays him on Nomanisan. I suppose Syndrome believes he’s serving the “greater good,” but it’s certainly not in the same vein as the more serious Ozymandias. Syndrome is really only concerned with satisfying his own ego and eliminating the very concept of being “special” or super. Ozymandias carries his plan forth because he honestly believes it’s the best solution for mankind. The ban on heroism prevented heroes from heroing without the fear of legal action, but the supervillains were already operating outside the law — the ban opened the door to a whole new world of crime. You’d half-expect the newly unstoppable villains to take over the planet, but flash-forward 15 years and there’s no evidence of mass slavery, destroyed cities, a villain king — nothing. The supervillains are apparently as extinct as the heroes. When Mr. Incredible sneaks out to do some occasional crime fighting by night, he’s taking on regular old petty criminals. The article also points out that not long after the Incredibles return to the public eye at the end of the movie, the Underminer arises (literally out of nowhere) as a new, malicious supervillain. Mike, the author, makes the assumption that he’s the first supervillain in a long time, thus claiming the Incredibles to be the cause of some sort of supervillain outbreak. This isn’t really grounded in any tangible proof, though. Supervillains may not be running around on the screen during the movie (besides Syndrome), but that doesn’t mean they don’t exist. And even if it did, that’s correlation, not causation. Also, that makes me wonder the motivations of these supposed villains. Why would it make sense for you to only be a supervillain if there are superheroes around? Is the assumption that they’re bored and only willing to commit crimes if there’s someone as strong as them ready to foil their plans? When you think about it, the whole thing falls a bit flat. I think it’s more reasonable to assume that the super villains were still around, but never a pervasive threat. In fact, there probably weren’t that many of them at all to begin with. Mike even points out that the villains (like Bomb Voyage) don’t have any “super powers,” which means the authorities were probably enough to deal with them. They just did what they pleased and avoided capture, which became that much easier once the superheroes were banned. We also don’t know if superheroes still fought villains as vigilantes (similar to Mr. Incredible and Frozone) over the years despite the ban. So there you have it. 10 years later and we’re still talking about The Incredibles. Now that’s how you know Pixar is good at making movies. I feel like the central comparison with Watchmen still holds up, even if the details don’t – superheroes gone, coming out of retirement, etc. I’m sure that’s also featured in a bunch of other superhero stories too, but these two are really prominent in discussing it. With Marvel looking at Civil War as source material for the next Captain America film, this also raises an interesting point about the reason why the superheroes get banned or regulated in stories. It’s always presented as because they cause chaos, yet superheroes are almost always forces for order in their aims and actions. They uphold the existing order in a way that’s arguably quite conservative, and in that sense hold back the possibility of chaos. Which maybe raises an inconsistency in the way these stories pan out, or perhaps means there’s a tragic contradiction at the heart of any superhero’s existence – they want to keep things safe and stable but they keep making a big destructive mess. Another story that does this (to an extent) is the D.C. event, Kingdom Come. It’s years since I’ve read that, but doesn’t it show them having achieved some peace and stability only for their superhero existence to come back and bite them? In which case it’s a perfect example of exploring that theme from a different angle (or of my terrible memory for DC comics). Never watched Watchmen, but I doubt it’s anything like Brad Bird’s beautiful creation. It’s completely different. Tonally and otherwise.